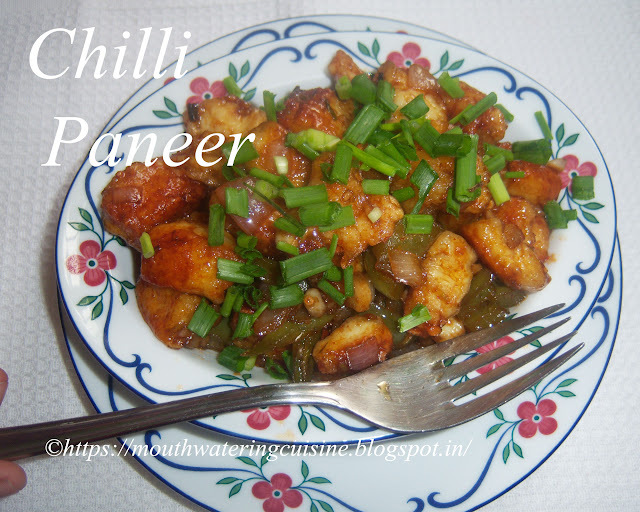 Today I will post how to make chilli paneer. It is another Indo-Chinese snack item. Yesterday it was a holiday for kids here becoz of some local festival. So they are at home and wanted something different and special. It should be spicy also. So, I made it and the result is awesome. They liked it very much. Paneer and capsicum are the main ingredients in the dish. They are stir-fried with some sauces. I used homemade paneer for this. We can use store bought also. 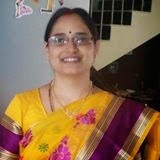 I am very fond of paneer, whenever we go out for dinner I prefer to take something with paneer. Chilli paneer is one among them, most of it I only consume. Chilli Paneer -- An Indo-Chinese starter. Cut paneer into cubes. It can be prepared one day before. Chop onion, capsicum, green chillies, spring onion greens, garlic and ginger. In a mixing bowl combine paneer and cornflour with little water. Take water as little as 1 to 2 tablespoons only. Heat oil in a kadai, drop the paneer cubes coated with cornflour. Stir fry them till they become crisp and turn light brown colour. Here I have done a mistake by dropping all paneer at once, so please don't do that. Drop 4 or 5 at once and fry them. Take them onto a absorbent paper. Heat the same kadai, add oil to it. Add garlic, ginger, onion and capsicum. Fry them till they become soft. Now slowly one after the other add all the sauces, soy sauce, tomato sauce and chilli sauce. Lastly add salt also. Fry them for a while and then add paneer to it. I missed vinegar, but it should be added at this stage to make it a little bit loose. Let the paneer and all the veggies coat well with the sauces. Switch off the flame and take it onto a serving plate and temper with spring onion green. Serve hot chilli paneer any time.